Generations of Railroaders can trace the roots of their heritage at The Altoona Railroad Museum. Known as the only interactive Railroaders Museum in America! You will experience Pennsylvania Railroad History through sights and sounds that will bring your family back into an historic era. I can't imagine anybody interested in visiting attractions through Pennsylvania and not taking the time to visit The Altoona Railroaders Memorial Museum and the beautiful World Famous Horseshoe Curve. 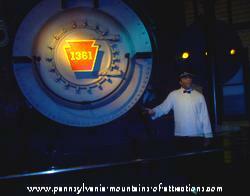 Pennsylvania Railroad History has fascinating legends that date back to our early Western days. Immigrants flocked to America to build railroads across our nation. The Historic Altoona Railroad Museum pays tribute to the many Railroaders that built, worked, and retired from the Pennsylvania Railroad. Some people would argue that the Railroad Industry and its worker are a dying breed. In my opinion it's an industry and breed that will never die. It's a piece of Pennsylvania History that will live on through future generations. With the gas prices going up not only by the day but by the hour, along with truck driver shortages across the country, and the congested air travel, Railroad Travel and shipping has to be the only way left to fight our nations fuel crises. If you are looking for a safe stock to invest in, take a tip from me and buy some stock in Pennsylvania Railroads. Do you know someone that worked for the Pennsylvania Railroad? There is a computerized database available to look up that family member or friend. If you feel there is someone missing from the database you can provide the information and the Railroads Webmaster will put that information into their database. YOU CAN FIND A LINK TO THE ALTOONA RAILROADERS MEMORIAL MUSEUM WEBSITE AT THE BOTTOM OF THIS PAGE. I can't help but wonder how many cities across American can say it was built around a railroad. Altoona, PA is without a doubt a true Railroad City. The nickname for Altoona is "The Mountain City". The word Altoona is derived from the Cherokee word, "Alatoona", which means, "the high lands of great worth." The Altoona Railroaders Memorial Museum has duplicated life in Altoona when the Pennsylvania Railroad was booming, back in the early 1950s. You'll find so many places on the second floor that was once established businesses in Altoona, PA.
You will be blown away with places like Kelly's Bar. 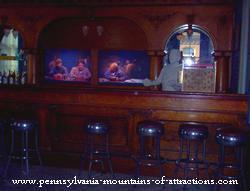 This bar was located very close to the entrance to the Altoona Railroad Shops. The shops were well spread out throughout the city with many entrances. One entrance was located at 12th Street. You would see a steady stream of traffic going to and from the shops. People could set their clocks each day when hearing the shop whistles blow. As you browse through the second floor you'll notice the different neighborhoods duplicated, like Dutch Hill and Little Italy. There are still businesses that exist today, like LaJo's Italian Food Store. The neighborhood is still known in Altoona as Little Italy. My favorite attraction in the Altoona Railroad Museum is The Newsstand. It is a holograph of a newsboy standing inside. It's fascinating to stand there and listen as he tells you the story of old Altoona. I remember that newsstand at the foot of the 12th Street Bridge. I can remember stopping there when I was a kid and buying candy to take along to the Olympic Theater. There are three floors of attractions through the museum. Each floor offers a unique Pennsylvania History that allows you to take your time and explore all the aspects of what it was like to work in different areas of the Pennsylvania Railroad. On the first floor you'll find a whole different atmosphere. From the moment you walk through the door you'll feel like you just stepped back in time and are about to board an old steam train. You'll hear the unmistakable sounds of steam engines and train whistles blowing. The first attraction you'll see in the lobby is the life size replica of K-4 #1361. It stands tribute to the 6,000 steam locomotives built in Altoona. This replica comes complete with a replica of a train conductor, ready to greet you for your trip. 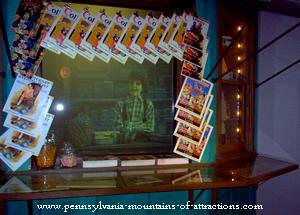 Enjoy spending time in the Altoona Railroad Museum Theater. 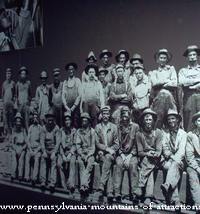 Here you'll watch films titled, "Altoona At Work" and "An Era of Steam". Find out why quiet little Altoona, at the foot of the Allegheny Mountains, became the bustling heart of construction for the Pennsylvania Railroad. Do you know that during WWII Altoona was on the top 10 list of where the Nazi's were planning on bombing? They knew if they could interrupt the Railroad service in this area it would cripple the country. Without a doubt The World Famous Horseshoe Curve was at the top of that list. The third floor of the Altoona Railroad Museum holds the children's museum, complete with model train displays. Children love playing with the many toys while parents wonder through the museum. For those of you that are real Railroad buffs, you'll be interested to know there is a variety of old train cars and equipment used by the Pennsylvania Railroad stored on the grounds on the outside of The Altoona Railroad Museum. As you can see the antique equipment is well taken care of and very nicely displayed. You'll find a lot of information as to what the equipment is and what is what used for during the period. One interesting train car on display is the private rail car that belonged to Charles M. Schwab. The Altoona Railroad Museum acquired this attraction to go on display in 1975. You can read the history of Charles M. Schwab and the history behind his connection with Lorreto, PA and Mount Assisi . This is the location where the famous steel magnet built his limestone mansion, known as Immergrun. 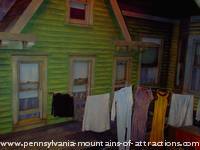 Enjoy learning the rich history through the Allegheny Mountains of Pennsylvania. Spend time discovering the many Pennsylvania National Memorials . Do you know about the ghost hunt at the Altoona Railroaders Memorial Museum ? Read the testimony of the ghost sightings from the museum employees. See the pictures I took of the ghostly orbs. With so many attractions through the Allegheny Mountains why would you think of spending your family vacation anywhere else?